Our travels are coming to an end. This is our last full day with our friends Rob and Annie in Boulder in Colorado. Tomorrow morning we leave for Denver Airport and return to Washington DC and Friday we fly back to the UK. Last night was good as we met our other good friends from Boulder, Paul, Ed and Johanne for dinner at one of the local brew pubs, the Walnut Brewery. Didn’t like the porter, too sweet and hoppy so called in at the Mountain Sun brew pub on our way home with Rob. The Java Porter nitro version was fantastic so I had a second just to make sure. Earlier yesterday we did a snowshoe hike to Red Rocks Lake in temperatures around -15°C and 30mph winds. It was chilly! I took some pictures from the frozen surface of the lake but not the one I wanted as the surrounding mountains were in cloud. We decided that we needed warming up so headed for the local brewery in Nederland on our way back to Boulder. Jolly nice Redemption Stout. 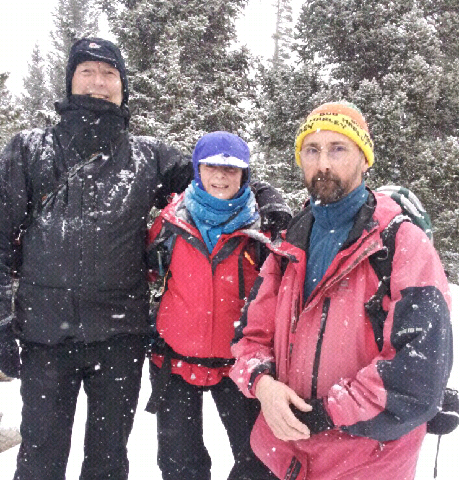 We snowshoed the day before too, to Lost Lake near Nederland. It snowed the whole time. It was a good walk though. See image of me, Jan and Rob below. Since the last blog post we have skied Canyons near Park City. This had the worst snow of all the areas but I took a good shot of a single set of ski tracks in amongst Aspen trees and shadows. Hope it prints as well as I expect it to. The 6th and last ski day was in Steamboat Springs last Saturday. The snow was poor here too but it was interesting to ski as we had heard so much about it. In the evening we met and had dinner with Carol and Jack, friends of Rob and Annie. They moved there many years ago. It was very enjoyable and turned out both were pilots and had their own planes. I was stunned when Jack then offered to take us up in their plane the next day! It would have been churlish to refuse such a generous offer so with much excitement we met up the next day! It was a blue sky day and cold, perfect visibility too. Jack was meticulous in his pre-flight checks of his Cessna then it was up and away above the local mountains. I didn’t want to take photos through the windows so worked out that sitting up front with the side window open was the best way to take my shots. The window only opened to about 45° so I could only take photos looking down between the bottom of the window, the wing strut and the landing wheel below the window. No expansive views or skies, just pattern pictures of the Mount Zirkel area as well as Steamboat Springs ski slopes, etc. Fingers crossed they come out as it was a bit bumpy at times and I had to use shutter speeds of 1/125 and 1/250. The flight was exciting for another reason though; Jack let me take the controls and ‘fly’ the plane for a few minutes. Jan, sitting behind me, didn’t seem to share my excitement during this time and was relieved when Jack took over again! I took 3 rolls of Ilford FP4, 30 photos during the hour long flight, which flew by! It has been great spending so much time with Rob and Annie but I am actually looking forward to getting home as we have been away almost 4 weeks. I am also impatient to see what new pictures I have in the 61 rolls of FP4 so that I can think about which ones to add to the web site.